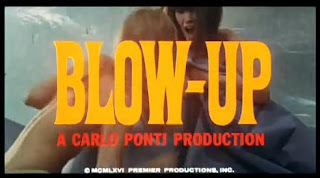 LONDON - In these days I'm meeting models (they go mad for Milan), so today Christmas day dedicated to an old-fashioned movie (year 1966 England world champion), I watched again the film Blow-up :) by Michelangelo Antonioni, the Italian director who inspired Oasis with his film Zabriskie Point (see this old post), produced by near-Milan-born Carlo Ponti (Sophia Loren husband). My favourite director is Alfred Hitchcock, and there's a bit of him in Blow-up, some mystery, and also a bit of Swinging London which reminded me of Carnaby Street and Pretty Green. The final scene in a field is meaningful, as the Beatles said: Strawberry fields, nothing is real.